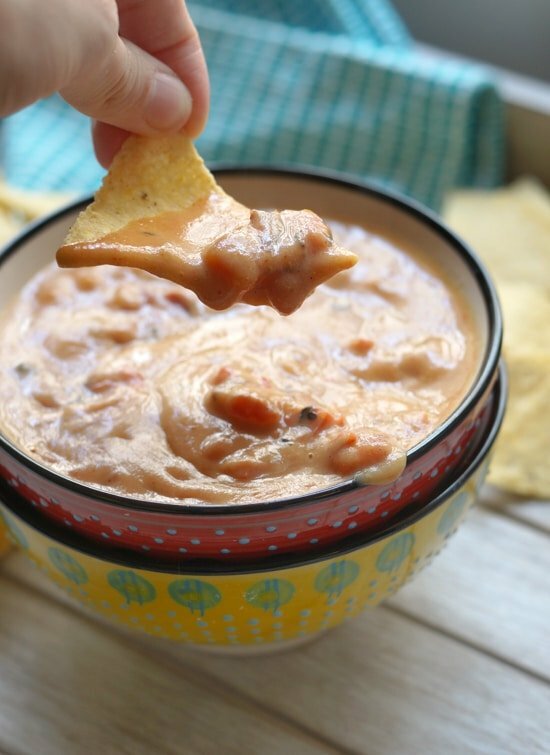 One of the things I’m known for during football season is my dairy-free Queso dip. All of our friends love it! However, since that popular dip is cashew-based, I wanted to create a recipe that was nut-free and lower in calories for those who want an even healthier dairy-free alternative. 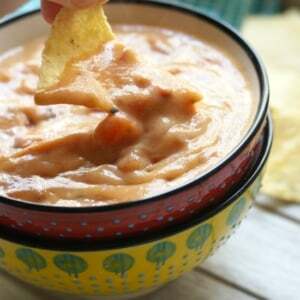 Rather than relying on nuts for creaminess, this queso gets its silky texture from sweet potatoes! When combined with Rotel-style tomatoes and green chiles, along with the right seasonings, sweet potatoes become surprisingly creamy and create a satisfying dip that is even properly combined when served with baked tortilla chips. Though it’s hard to beat my original queso dip’s flavor, my taste-testers agreed that this allergen-free alternative is a truly satisfying option. I hope you all will agree! In a high-speed blender, combine the cup of mashed sweet potato, water, salt, chili powder, nutritional yeast, and lemon juice and blend until completely smooth. Warm the diced tomatoes in a small saucepan over medium heat, then pour the cheese sauce from the blender into the pan and stir well to combine. Heat the mixture until your desired serving temperature is reached, then serve warm with your favorite chips or crudites. 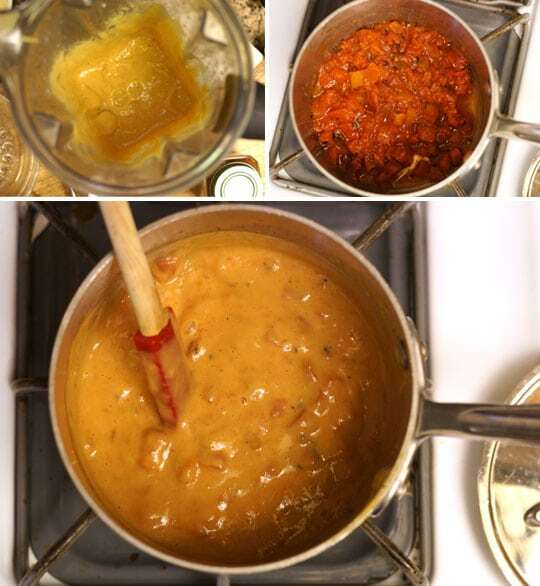 Leftover sauce can be stored in a sealed container for up to a week. Reheat over the stove, or in a small crock pot, before serving again. 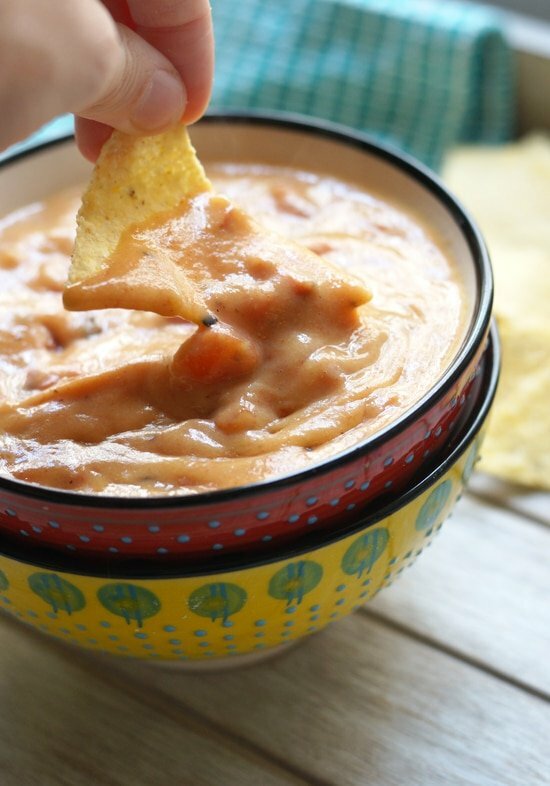 A creamy dairy-free queso made with sweet potatoes! If you don’t have sweet potatoes on hand, Yukon Gold potatoes also work very well in this recipe. Nutritional yeast provides the “cheesy” flavor to this dip. If you can’t use it, the resulting dip will probably still taste okay without it, but it won’t be as cheese-like. If you’d like a slightly more authentic queso, and can tolerate cashews, I recommend making my original recipe instead. All of my taste-testers agreed that this Sweet Potato Queso is good, but the other one is even better. Reader Feedback: What’s your favorite type of dip or appetizer to serve to guests? Thanks for all the great information and recipes you provide on this site, I have tried a handful of them and all have turned out great. I had a question about Nutritional Yeast. Is there a difference between Nutritional Yeast and Nutritional Yeast seasoning? This recipe calls for 1/4 cup of Nutritional Yeast but there is a link to Nutritional Yeast seasoning. Are they interchangeable? Ah! A sweet potato dip. I was looking for a tomato-free alternative. Love it! I printed this out to try, lost it, spent forever trying to find the recipe again, few, YIPPIE ! SO SO SO GOOD!!!!! I wanted to eat it with just a spoon!!!! I’ve made your cashew version too over the summer – loved it, but actually liked this one more! Was thinking…as I finished the LAST tiny little dish of leftovers (while searching for another sweet potato)…how about using a butternut squash?!? I kind of what to try it….hmm. Thanks for another yummy recipe!! Thank you so much for this recipe! I’ve tried making vegan queso with cashews before and it just didn’t satisfy the cheese fix I needed. I tried this recipe with 2 Yukon potatoes and it turned out amazing! I’m thinking maybe you could use steamed cauliflower in place of potato…!! Great recipe thanks can’t wait to try it!!! Just made this, though I didn’t have canned tomatoes with chiles. I used regular diced tomatoes and a dash of cayenne…. I liked it better before I added the tomatoes and cayenne. Was really convincingly cheesy! Thanks for the recipes. I’ll follow it more precisely next time. One thing- should I drain the juice off the tomatoes and chiles? I didn’t drain this time and I think it watered it down. I was thinking I’d drain next time. I was wondering what is the flavor difference between a regular sweet potatoe and the white one? I have never tried a white sweet potatoe. Thanks for your yummy recipes. I LOVE this dip! I especially love the fact that it is low in fat, which my digestion thinks is terrific. I did it with regular potatoes and it worked swell. Also, the leftovers of this dip turned out to be an AMAZING pasta sauce! This dip and some pasta penne and you have a great meal for a high carb vegan. Thank you, again, Megan! I made this yesterday and it was soooo delicious! Thank you so much. It’s nice to have an alternative to cashews. Nutritional yeast is a yeast extract made as a nutritional supplement, food additive and flavoring. It is an excellent source of nutrients, especially protein. Nutritional yeast is quite different from brewer’s yeast, baker’s yeast and pathogenic, or disease causing, yeast. It cannot cause or contribute to Candida yeast infections because it is derived from a different species that has been deactivated. It is what gives the recipe a “cheesy” flavor. This was SO. GOOD. My husband is a regular nacho cheese kind of guy and he inhaled it, lol! I only had a regular sweet potato. It would be interesting to try with the white. Thank you for the recipe! I just wanted to update this by saying my husband (who does not eat dairy free food) looooved this. He ate most of it, not leaving much for me! Boo! But I forgot to discuss the sweet potato issue. I only had the orange-coloured sweet potatoes so i added some carrots (thanks to a comment from the purely twins) to cut down on the sweetness but keep the orange colour!!! Also today with the leftovers I made “cheesy” potatoes!! Just another update….. I keep making this and I love it. This time instead of the tomatoes, I just added salsa to my taste. No heating but I made it when the sweet potatoes were still hot. Fantastic!!! This sounds tasty! Thank you! I love sweet potatoes! I got curious when I noticed you said to keep the leftover sweet potatoes for a smoothie! I hadn’t thought of that before, & that sounds like it could be fantastic! I’d love to hear which ingredients you’ve found to compliment the sweet potato, & what your favorite sweet potato smoothie is like?! As for dip, my current favorite to make is hummus meets avocado dip! This looks amazing! Also, thanks for the reminder to try your other dip 😉 I bought the cashews and never got around to it, but have several recipes I’d like to try dairy free! I love the idea of using sweet potatoes over nuts. I know nuts are good for us, but I guess everything in moderation and I can haywire on them and need to make some substations. Love those Yukon Gold taters too. I love spinach/cheese type dips but don’t indulge too often. Wow, compared to some others, this recipe seems easy and looks creamy and delicious. Do you think it would be weird to use it as a cheese sauce for other dishes (I’m thinking of macaroni and cheese)? I love that it has no nuts and isn’t crazy fattening. we have done this and used carrots before, so good! Looks really good. I made the one with soaked cashews which was delicious but I will definitely try this one too. Sweet potato saves teh day ! Not seen or sued a white sweet potato before but will keep an eye out. I have been loving sweet potato recently – even manages to make a sweet potato cinnamon porridge type thing for breakfast ! As for dip – I am a guacamole girl through and through! I have also made this with a combo of yukon potatos and carrots and it turned out just like cheese! i haven’t ever added the rotel, i will try that next time! Awesome idea!!! i wonder if the nutritional yeast in this recipe is Whole30 approved. any idea? Whoa you just took football snacking to a new level. I love sweet potato with black beans and avocado, so I imagine this would pair well with the chili powder. Oh and some nooch in the mix! Yum. Thanks for sharing! Oh yes please!! is what came to mind when I saw this recipe. Can’t wait to try it! !